The black chinned hummingbird is a delightful visitor to your garden. All about how to attract them to your garden, how to identify them, hummingbird food formula and best hummingbird feeder to keep these birds coming back for more. The black chinned hummingbird is more delicate than most other hummers. It has a smaller head, thinner neck and more slender body. Both adults have a green body with white underparts. The adult male has a black chin with a thin strip of iridescent purple bordering its chin. Females have a pale throat. The female's three outer tail feathers have broad white tips. Both sexes have flanks glossed with dull metallic green and fairly straight black bills. 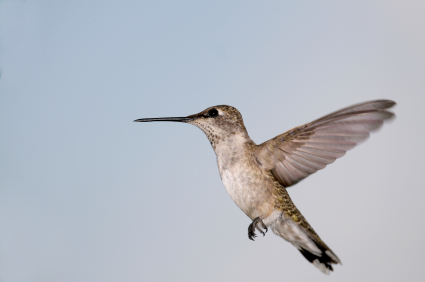 These hummingbirds feed on tiny swarming insects, nectar from flowers and they love sugar-water from feeders. They feed from close to the ground to high up in trees. They are regular visitors to garden feeders. They also perch on dead branches in tall trees. This hummer is found in lowland deserts, in forests and in urbanized areas, as long as they can find a tall tree and flowering shrubs. The court ship dive of the male is spectacular. He can dive 66 -100 feet in order to attract his mate or defend his territory. Their wingbeats make a loud buzzing noise. Most black chinned hummingbirds winter along the Gulf coast, although some prefer to spend the winter in Texas. The female takes on all parental care. Sometimes they feed young in one nest and incubate eggs in another. She lay two eggs. Nests are built 3-10 feet off the ground and are made of plant down secured with spider webs. The eggs take 13-16 days to hatch and the babies are generally ready to leave the nest at 20-21 days. Best Humming Bird Feeders will give the inside info about our favourite feeders for humming birds. You can attract this bird to your backyard by supplying it with its favourite refreshment. Make a sugar water mixture with a 4 to 1 ratio - one quarter cup of sugar dissolved in one cup of water. It is not necessary to colour it. just be sure to change the water before it discolours - you don't want the hummingbirds to get an infection. During hot weather, change the hummingbird formula daily. Follow my hummingbird food recipe for a simple nectar. Also filled with useful tips on cleaning hummingbird feeders. Choose from our favourite Hummingbird Books to make your hummingbird watching even more interesting. 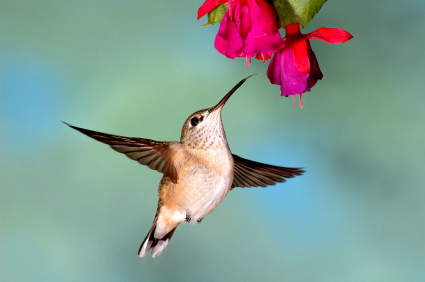 Find out more about the Ruby Throated Humming Bird.